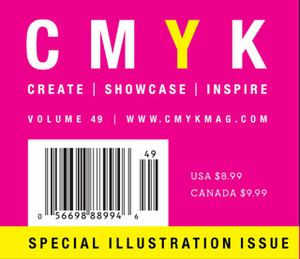 March 7th, CMYK Magazine #49 went to newstands as some sort cruel birthday gift for me. The editors decided to subject their readers to illustrations (if you can even call them that) I happened to have banged out when I was still doodling for dollars, back in the before-time, before the continents had drifted apart, before the ice receeded to the poles. Without my permission, even. Imagine that. 'Oh, here's a hack job that Zimm did for Mountain Dew that was obviously done under extreme duress because he simply needed some cash and didn't care where it came from. Let's print that! Wait, wait, here's a stunningly meaningless turd that Zimm did on a hangover for the 'Got Milk' campaign. Print it? Heck yeah! Ask his permission? Why bother!' Imagine the joy in the seeing these reminders of hackery and despair in print once again. Thanks CMYK! I usally hate my birthday anyway! Where did CMYK find these forlorn relics, these dried-up left-overs from the salad days of illustration (people would buy anything back then, I tell ya)? On my largely forgotten website that even I haven't looked at or updated since the internet was discovered. A cruel reminder to all you people who haven't updated your sites in years. Just keep in mind, somebody might actually publish that crap without even asking! Backstory: Ronald J. Cala wrote me an email some time back to inquire if I would write something for the magazine. I wrote it, sent it in, decided I hated it, then asked that it not be published. Well, truth be told, I told Ronald J. that I didn't like what I wrote when I happend upon him at this years' AI Party, so he probably forgot. It's the only thing I remember distinctly from that night, so I know these things happen. Happily: My article, along with the editors largely mis-informed (who the heck has time to call and get it right these days?) introduction, is sandwiched between articles featuring Scott Bakal and Yuko Shimizo. It was nice seeing my friends, at least! Zimm, you are living proof of the evolutionary process. From Doodle bug, to Web God. You are an out of body life form now, Pure Intellect. - cue the music now; the soundtrack to 2001: A Space Odyssey. How did they get the high-res art? Happy Birthday Zimm, you're not alone, I got sooo many things in my illustration closet that I dread will someday surface. After I'm dead I hope. I'm not sure if I should congratulate or commiserate. Happy Birthday to the wizard behind the curtain! We all have stuff in circulation that embarasses us, Zimm. Happily—at least in my case—nobody cares. Hirpy Bathday! Happy-unhappy B-day, Robert... they, out of all people, should know MUCH better.